Here’s a stunning cake recipe from our recipe journal – Bestow Treats II. I personally love this cake, it embraces New Zealand food with the use of kumara and berries, is easy to make and tastes delicious. Make it for Christmas day just to be different or make it to take to pre Christmas celebrations, it’s also great as a dessert. Now that berry season is upon us, use fresh berries rather than frozen. Preheat oven to 150 degrees celsius. Line the base of a round, springform 23cm (9 inch) cake tin with baking paper. In a large bowl mix together dry ingredients. Add oil, vanilla, eggs and kumara. Mix well. Fold through boysenberries until colour is just starting to run. Spoon mixture into cake tin and smooth out. Bake for 1 hour and 20 minutes until top has browned. Remove from the oven and allow to cool in the tin for 15 minutes. Remove from the tin and allow to cool for a further 15 minutes. Slice and serve with coconut yoghurt (dairy free) or whipped coconut cream. Want more gluten free, dairy free, refined sugar free recipes? 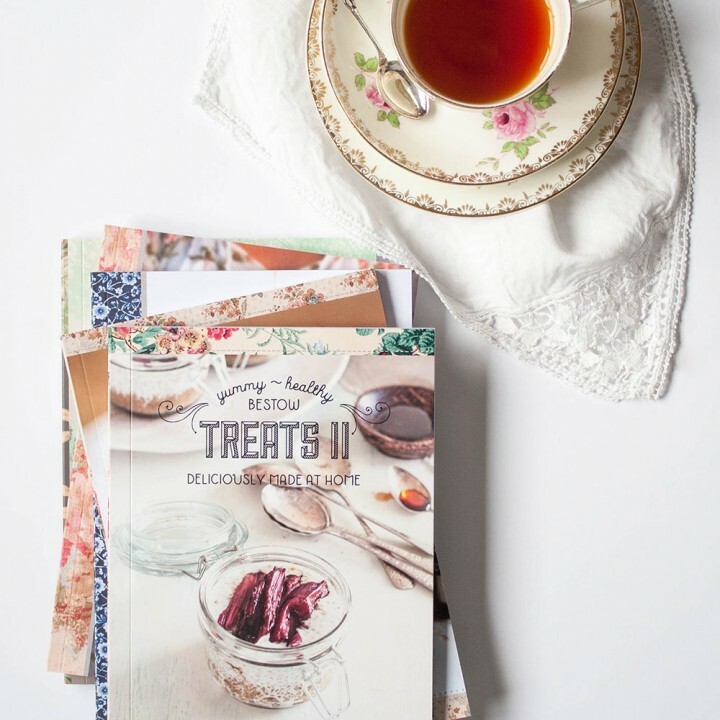 Many more recipes like this one are available in a gorgeous recipe journal – Bestow Treats II, that I have co-produced (as well as 3 other journals) with Janine Tait from Bestow Beauty. Line the base of a 19cm (7.5″)springform, non-stick cake tin with baking paper. I always use this size tin for a standard cake recipe so that I get a higher cake. Melt the butter and chocolate together over a low heat. Separate the egg whites and yolks into two bowls. Add two tablespoons of the sugar to each bowl. Beat the egg yolks and coconut sugar until a pale caramel colour. Stir in the melted butter/chocolate mixture and the cardamom. Whip the egg whites and coconut sugar until firm and glossy. Fold the egg whites into the chocolate mixture. Pour into your prepared cake tin and bake for 30 to 40 mins. Check after 30 mins by inserting a skewer and see if it comes out clean, if not cook for another 5-10 mins. Remove from the oven and cool in the tin for 30 mins then remove to a baking rack to cool completely. The cake will sink in the middle but that will be filled with frosting so don’t worry too much about it. Blend all the frosting ingredients well with a stick blender, you want this to my smooth and silky. Spread all over your cake! You will be able to share this cake with a few people as smaller slices are enough due to the richness. My youngest son loves pancakes. He’s 9yrs old so of course he loves pancakes! It’s a regular weekend request – “Mum can you make Croatian pancakes?”. He loves that aspect of our heritage. So instead of my usual recipe I decided to see how John from he needs food makes them (his Croatian recipes are amazing). His recipe was pretty much the same as mine except that I don’t use soda water and add in a tablespoon of melted butter. I followed his recipe to the letter and the result was beautiful, light pancakes with just the right amount of sweet – yum! By the way my son eats them just with lashings of melted butter. Beat the eggs with the milk and soda water, whisk in the flour, sugar, salt and vanilla until smooth. Leave to sit for 30 minutes. Heat a knob of butter over a medium-hit heat in a small non-stick frying pan. Tip out the excess butter into a heatproof dish and put aside. You want to have an even spread of butter over the pan. Ladle in about 1/3 of a ladle of batter, tilt the pan to spread evenly. Cook until the edges are starting to lift then flip over and cook the other side. Between each pancake I brush some of the excess butter over the pan with a pastry brush. Serve with berries and mascarpone and chopped pistachios. Fresh quark, nom nom, looks like freshly made vanilla ice cream! A beautiful, creamy, velvety mixture. Pre heat oven to 150 degrees celsius. Line a springform tin with baking paper. Combine all the above ingredients. Spread the crumbed mixture over the bottom of your springform tin and press firmly. Place in the fridge for 30 minutes to set. Combine the quark, sugar and flour in a large bowl and beat until the mixture is light and fluffy. Add the eggs, butter, vanilla and lemon zest and beat until smoothly blended. Pour the filling over the biscuit base in the springform tin. Place the tin on a baking tray as there may be some leakage from the base. Bake for 1 – 1 1/4 hours until the filling is set and the top is golden brown. Cool in tin and serve. This is a great, light, summer dessert, ideal for those long hot days. It needs to be frozen overnight so prepare the day before. The recipe is originally from Nourish Magazine. Top the strawberries and process them briefly so they are pulpy but still a little chunky. Beat the egg whites, sugar, vanilla and processed strawberries in a large bowl or electric mixer. Continue beating until the mixture is quadrupled in size and is thick, pink and mousse-like, approximately 5 minutes. Do the taste test – yum. Do another taste test because it’s irresistable. Mix the melted butter and biscuit crumbs together and press into a lined 18cm spring-form cake tin. Then pour in the now gorgeous pink egg white mix and freeze for at least 24 hrs. Serve with cream, yoghurt or icecream and more fresh strawberries. These are delicious, light tarts that are not too sweet (no refined sugar) and are gluten free. I have also made this as one large tart you just need to cook the crust longer. Melt the butter and honey together then add in a bowl with all other ingredients, mix well. Using your fingertips, press dough into the bottoms and sides of 8 x 8cm tart pans (buttered or nonstick) ensuring the crust is not too thick. Prick holes with a fork. Bake in the oven for 10 mins or until golden brown. Leave to cool in the tins, then place in the fridge til cold before you remove them carefully from the tins. I find this step helps with perfect tart shells. Combine all ingredients in a saucepan. Bring to the boil. Turn down a little and cook until the pear are soft but not mushy and the mixture is surupy, this takes about 20 – 30 mins. Keep stirring to avoid the mixture from burning. When you’re ready to serve, scoop pear compote into the tart shells. Top each tart with a dollop of thickened cream, greek yoghurt or mascarpone and garnish with rosemary.